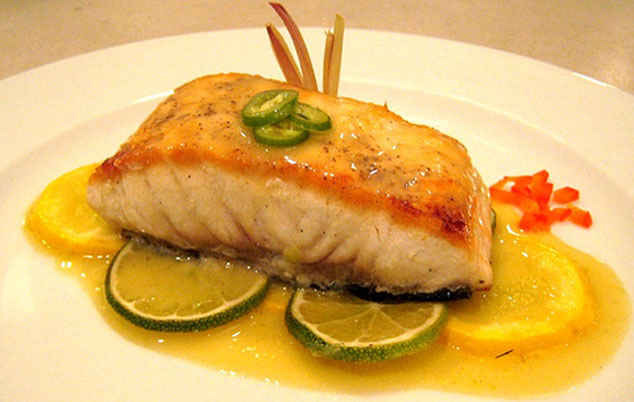 Sturgeon – the refined delicacy which is highly appreciated in many countries of the world. In Russia this magnificent fish called "imperial" from time immemorial and gave on a table at the imperial yard. Today from sturgeon prepare a set of tasty viands, suitable both for daily, and for the festive menu. 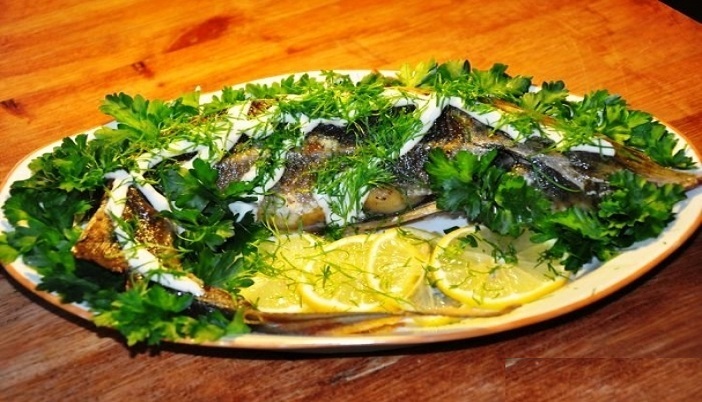 So, we offer you some tasty recipes how to prepare this fish in an oven. The sturgeon baked in an oven in such a way turns out gentle, friable and unusually fragrant. Fish to clear of scales, to draw and wash up, sprinkle with dry spices and salt. To connect boiled egg yolks, mustard, sour cream, vinegar, butter and powder of a nutmeg. To rub with the received mix a sturgeon from within and outside. In a carcass to lay thin lemon segments, bay leaf, greens and rosemary. To fix a paunch toothpicks or bamboo sticks. To cover a baking sheet a food foil, on it to lay out a half moon fish. From above to sprinkle lemon juice and to grease with butter. Densely to cover with the second layer of a foil and to place in the oven which is previously warmed to 180 °C. In 20 minutes to get, remove the top foil, plentifully to water a carcass with the emitted juice and to return to an oven for 5-7 minutes that fish was reddened. The ready baked sturgeon to lay out on the serving dish covered by fresh greens. To decorate with mayonnaise and large grapes. Singularity of this recipe consists in an original combination of gentle taste of the sturgeon baked by slices and juicy citrus sweet-sour sauce. Sturgeon to defreeze and cut on portion pieces. To sprinkle fillet with mix of salt, fish seasoning and pepper. To squeeze out juice of one lemon, to add to it vinegar and oil, it is very good to mix everything. Confectionery brush to grease with lemon and acetum mix slices of fish and to lay out them in the fire-resistant form covered by a food foil. Round a sturgeon to arrange thyme branches for aroma strengthening, to cover with one more layer of a foil and to send for 20 minutes to the oven warmed to 175 °C. After time to clean the top foil and to allow fish to be baked to a golden crust. In small capacity to squeeze out juice from one lime and a lemon, to add sugar, to salt and pepper to taste, to add butter and to bring to boiling on slow fire. To boil thoroughly 5-7 minutes before solidification. To lay out ready slices of the baked sturgeon on portion plates, to decorate with small cut paprika, circles of a lemon and a lime, to water with citrus sauce and a tax to a table. 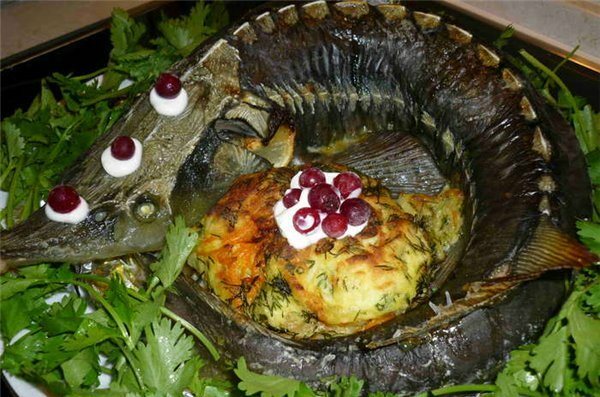 It is possible to bake sturgeon in an oven on any celebration. This fish possesses tremendous taste and gives to a holiday table special chic. How to prepare a sturgeon in an oven entirely the recipe tells very in detail and each culinary specialist will easily cope with an objective. Fish to draw, wash up, slightly to powder with salt and to set aside for 5-7 minutes. Then to rinse under water and to dry. Once again to salt, pepper, rub with spices and to sprinkle freshly squeezed lemon juice. From above to cover with olive oil. To cover a form for roasting a foil, to lay out a sturgeon and to pour in white wine. A foil very densely to pinch and send to an oven for 10 minutes. On the expiration of time to take out, open a foil and in such look to bring fish to full readiness. Before giving to lay out a sturgeon on the dish covered by lettuce leaves. 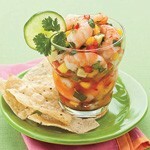 To decorate cherry tomatoes, segments of a citrus, cucumbers and olives and to offer guests. To prepare the stuffed sterlet very favourably at least also because it does not need a garnish. 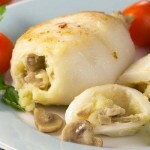 It is replaced by a nourishing and tasty rice and mushroom stuffing. Sterlet to draw, wash up and exempt from fins. From above to oil olive, and then to rub with pepper with salt. Onions and mushrooms small to chop and fry on a frying pan to readiness. To mix with previously boiled rice, to salt and pepper to taste. To stuff with rice and mushroom weight fish and to lay out carcasses on the baking sheet covered by a foil paunches down. By means of a confectionery brush plentifully to cover a sterlet with mayonnaise and to send to the oven warmed to 180 °C for 40 minutes. 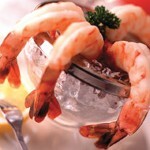 To sprinkle a ready dish with small chopped greens, to decorate with rings of a lemon and a tax to a table.